An easy and affordable way to organize your 5th Generation Toyota 4Runner Center Console using products from Vehicle OCD. 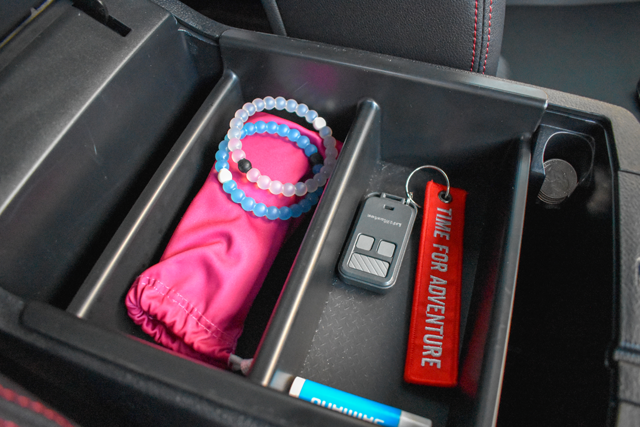 Straight from the factory, the center console in the Toyota 4Runner is basically a black hole designed to gather the clutter of your everyday items – including your sunglasses, flashlights, chapstick, cards, etc. The center console in the 4Runner is on the bigger end for center console size. With that extra space comes more room for clutter and disorganization. I tend to be a very organized person, especially when it comes to my vehicle. You may have seen my past review of the Rago Fabrication Modular Storage Panels I installed in my 4Runner trunk area to help keep that space organized. So you can imagine, having this big area of clutter in my vehicle was driving me a little crazy. I decided that I needed to find something to help organize my everyday items and help make better use of the center console area. In searching for a solution to help add some organization to the center console of my 5th Gen Toyota 4Runner I came across the accessories from Vehicle OCD by Salex Organizers. Vehicle OCD has three different product offerings made specifically to help organize your 5th Gen Toyota 4Runner – including 2 center console organizer options, as well as an organizer for your glove box. 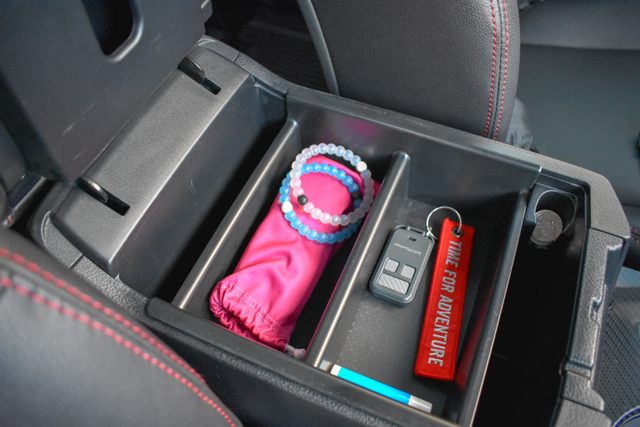 Vehicle OCD also produces center console and glove box organizers for a variety of vehicles. You can view their full product offering on their website here. Thanks to the various product offerings from Vehicle OCD you can now easily organize your Toyota 4Runner Center Console. Check out the products I’ve used below to help me keep my center console clean and organized. These are well-built and affordable vehicle accessories that I’d recommend for any 4Runner owner. No slip, removable, textured rubber tray liner prevents items from sliding and rattling in tray. High quality black ABS plastic with matte finish. Made in the USA. The Vehicle OCD Toyota 4Runner Center Console Tray was the first organizer I chose to purchase for my vehicle. I liked the idea of having an extra level of organization. I like to keep my sunglasses, chapstick, extra keys, etc in this top tray rather than having them floating around loosely at the bottom of my console. 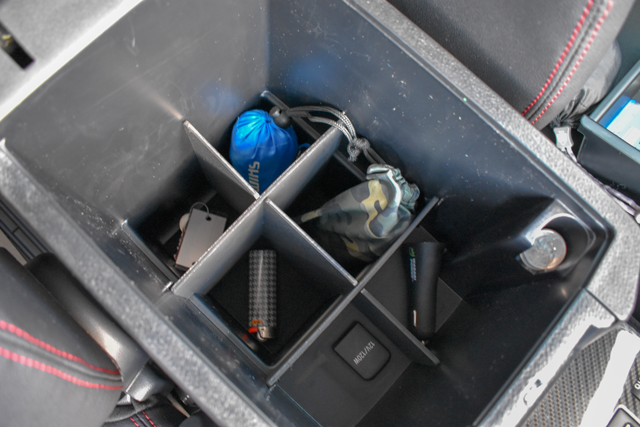 The center console tray is a handy place to keep those everyday items that you like to have easily accessible. It’s worth noting that the center console will only shut if the tray is pushed completely to the front. It is a little odd they wouldn’t design this to shut at any position, but it’s not really a major deal breaker either. 1/8″ thick black plastic with matte finish. Made in the USA. Fits 2010-2018 Toyota 4Runner. NOTE: Factory installed front console divider must be removed prior to installation. The Vehicle OCD Toyota 4Runner Center Console Organizer is basically a small divider that helps break up the bottom of the center console into 6 squares. This is a good option for someone who likes to be extra organized, but it’s not totally necessary. If you like to carry around a tissue box, or larger items, I wouldn’t recommend this type of divider-style Center Console Organizer since it wouldn’t fit. It’s a great place to keep those items that you like to carry in your car, but don’t necessarily use every day. I keep flashlights, reusable grocery bags, and some small tools and like that I’m able to keep them organized with this divider. 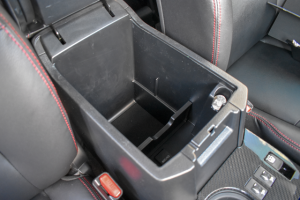 In my opinion, the Toyota 4Runner should have come with a tray like the Vehicle OCD Center Console Tray straight from the factory. I’d recommend it as an accessory to every 4Runner owner. For those that like the extra organization and storage, you can take it up to the next level with the Center Console Organizer and the Glove Box Storage Organizer. It’s also worth noting that Salex manufactures all of their products right here in the U.S. Overall, I think their products are high-quality and sold at a great value. For me, the added organization helps provide a peace of mind and it’s worth every penny.